Get Beyond the Tick Bite and Eat Right For Your Life. Whenever someone visits my house, the act of me nonchalantly jumping on a mini trampoline (i.e. rebounder) like it is a normal, everyday activity, tends to catch them a bit off guard. In fact, when I tell them that it is to help drain my lymph system, they become even more confused. What is the lymphatic system, what is its roll in the human body, and why is it so important to drain, are all questions I typically have to explain. While the lymphatic system may be common knowledge to me, most Western medicine doctors tend to avoid informing their patients on its role in the body. Therefore, I have decided to dedicate a post that breaks down what exactly the lymph system is, and ultimately answer the question of why I rebound. What is the Lymphatic System? Though closely related to the immune system in both function and role in the body, the lymphatic system tends to get the shorter end of the stick in the scope of America’s health and medical system. 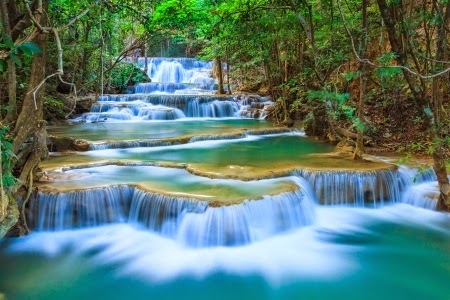 The term “lymphatic” is originally derived from “lymphaticus,” a word meaning “connected to water” from the Latin language. It is no surprise then, that the main function of our lymph system is to transport clear fluid throughout the body that aids in a variety of important detox mechanisms. As a subset of our circulatory system (of which is a large network of vessels and organs that oversees blood, nutrient, oxygen, gas, and hormone distribution) the lymphatic system regulates fluid retention, digestion, blood purification, and various responses to infection and inflammation throughout the body. 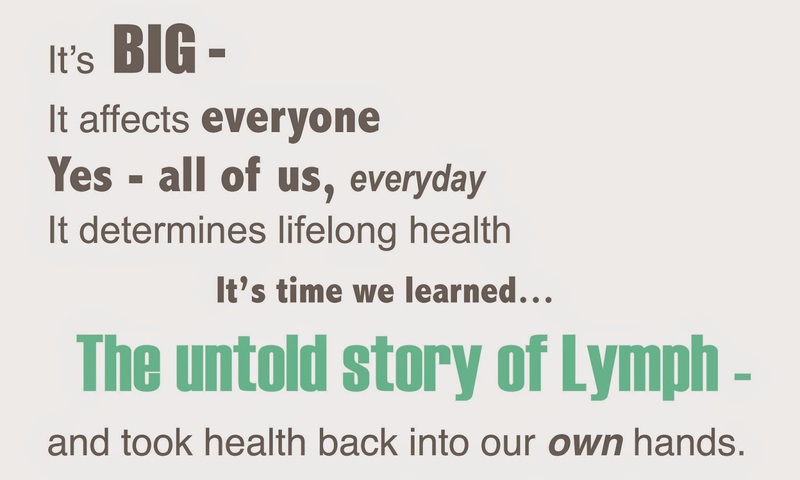 Overall, the lymph system is truly the foundation behind health from the inside out. Lymph fluid, which is a clear fluid highly resembling blood plasma, is made up of 90% water, and 10% protein, cellular waste products, dissolved gases, hormones, minerals, lipids (fats), vitamins, bacterial and white blood cells. Interestingly enough, though lymph fluid is transported throughout the body in a system similar in structure to that of veins, it only flows upward (unlike blood – which is up and down and all around). In the process of blood moving around the body, it enters into thin walled capillaries where it diffuses gases, nutrients, and waste. However, because capillaries do not directly attach to cells, blood plasma (containing white blood cells, oxygen, glucose, and proteins) leeks out and escapes into the spaces between the tissue of our cells. Because of this, lymph capillaries are located throughout the existing tissue, open and waiting to absorb this excess, “interstitial fluid,” which is what ultimately becomes known as “lymph.” Unlike the blood, lymph fluid does not have its own motor. Rather, it moves around the body through muscle contraction, nerve impulses, and fluid pressure in the system itself. Interestingly enough, it takes an entire day for lymph fluid to simply travel through the whole body once, which is quite slow compared to blood. However, there is actually twice as much lymph fluid than blood in the body. Once the lymphatic fluid is collected, it flows through what is called the “lymphatic system.” The numerous lymph capillaries that caught the excess fluid come together to create vessels that then carry the lymph solution throughout the body, filtering it before it goes back into the circulatory system. These vessels can be pictured like a string, strung with hundreds of pearls, each pearl being a lymph node. It is through these small, 500-700 lymphatic nodes stationed in the abdomen, armpit, groin, and legs, that lymph fluid is purified. Inside each lymph node is several lymphocytes and macrophages (i.e. white blood cells) that serve as defenders and filters against harmful products in the body. With reticular tissue fiber inside each node, they are able to literally catch any debris or cells that the lymph fluid may be carrying, which then the macrophages and lymphocytes attack and kill. As noted before, these nodes are strung together like pearls, with each one serving as a cleaning system, thus making the fluid more purified and immunologically boosted each node. These nodes can vary in size from an olive, to as small as a pin’s head. 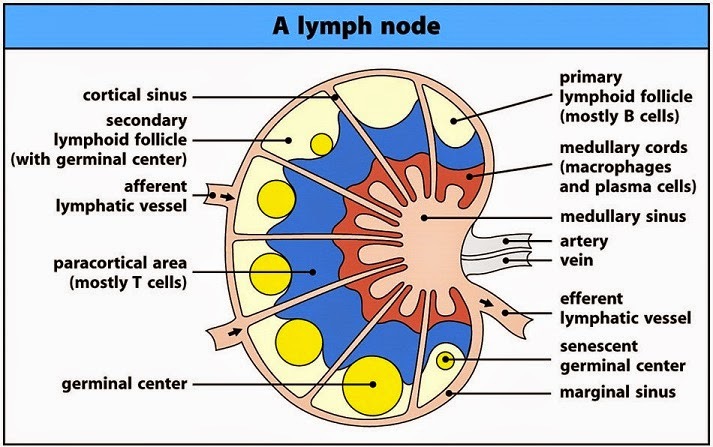 Though there are many nodes directly stationed in the lymphatic system, there are also bigger sources of lymph tissue that are disconnected from the vessel itself. These include major organs such as the spleen, thymus, tonsils, and small intestine, as well as bone marrow. Together, these systems serve in the same way as the tiny, bean shaped lymph nodes, by highly filtering lymphatic fluid. One example would be the spleen, which is like one, large, lymph node organ that filters the blood, while also housing many immune cells specific for defending the blood against antigens and disease. However, when this organ becomes enlarged, or then removed from the body (via surgery), the integrity of one’s blood becomes severely damaged. No longer can it support the rest of its neighboring organs, making one’s overall immune system extremely weak. 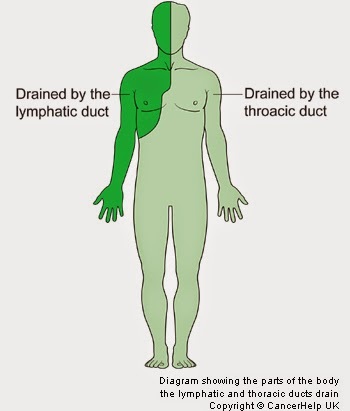 The differing vessels and nodes that comprise the lymphatic system, are all ultimately carried back to two main draining ducts to return lymph back to the blood. The thoracic duct is the main lymph drainer, and is located in both of the legs, as well as the abdomen, left arm and left side of the head, neck, and thorax. The right lymphatic duct is then responsible for draining the right arm, side of head, neck, and thorax. 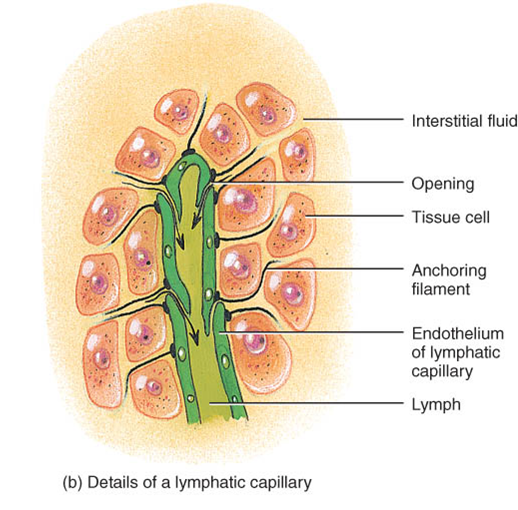 Another major source of lymphatic tissue is found in the small intestine. This large barrier that separates harmful particles from essential nutrients, is called “GALT” (i.e. gut associated lymphatic tissue). By making sure that nothing harmful passes into the body, this gut barrier defends our bodies from ingested bacteria, heavy metals, molds, fungi, allergens, chemicals, trans fats, and any other toxic, man made, or foreign ingredient we are exposed to in the world. Once the enzymes, acids, and gut flora in our intestines do their part in digesting a given food, GALT receptors take over. If there is something that they do not like, they will send off immune responses that cause mucus production. One common example of this is an increase of mucus when eating dairy products, due to the individual not having enough lactase enzyme to digest the dairy, and thus causing the GALT to produce an immune response. Overall, this important source of lymphatic tissue is the reasons why one’s gut is literally their “second brain.” By telling the immune and endocrine system when to create an inflammatory response, GALT ultimately serves as its own command system. Therefore, when it is functioning normal, food sensitivities and allergic responses are low and unlikely. However, when GI flora are compromised (whether due to illness, SAD diet, or stress), the overall integrity of one’s gut and gut lining is also compromised, causing GALT to be over-active. Peyer’s Patch, which is one part that makes up GALT as a whole, acts as another set of lymphatic nodes outside of the “system.” By monitoring intestinal bacteria, these lymph tissue nodules make sure that no pathogenic bacteria is allowed to thrive and grow in one’s intestines. What is special about the peyer’s patch is that unlike lymph nodes, these lymphatic nodules (along with the tonsils & appendix) are not encapsulated by connective tissue. Instead, the inner side of these nodules are lined with specific epithelial cells called “microfolds,” while the outside with other lymphatic vessels and lymphoid cells. Together, these important cells are what make up the immunity of one’s gut lining. When something is introduced into the intestines that they do not like, a full blown, full body inflammatory response is triggered to make sure that the pathogen does not get beyond the GI track. Therefore, without these organized lymphoid nodules acting as immune sensors, our bodies defense mechanisms are severely altered. Another component of the small intestine is chyle, also known as digested fat that is transported into the blood (i.e. LDL and HDL cholesterol) through the thoracic duct and cisterna chyli. When the GI track becomes compromised due to the lymph being sluggish or damaged, chyle flow is diminished, simultaneously causing an increase in nausea, toxicity, and worsening symptoms of the initial GI issue. The lymph system is one of the most crucial parts of the human body when it comes to fighting against foreign invaders. A common example of this is having swollen lymph nodes around the neck or armpits when one is fighting a flu or cold. Cellulite, the one thing that women absolutely fear, is also caused by impaired lymph flow. Due to trapped toxins in certain areas of fat, more than 90% of women have cellulite from weight gain (which is inadvertently caused by inactivity or toxic “food”). Genetic predisposition is also a cause for cellulite, though it is not usually the case. Essentially, this condition is created when a given area of skin bulges due to fat cells accumulating in one area, which then causes a dimpling effect (due to connective fibers in the skin being pulled down as the fat pushes out). By improving circulation of the lymph areas, cellulite, and the toxins and lymph fluid that have accumulated to cause the dimpling, can be successfully ridded from one’s body. It is safe to then say that cellulite is not necessarily something that only happens in individual’s who are overweight, as skinny people who are internally unhealthy may experience similar problems with their skin, due to an overburdened lymphatic system. Other common causes that make our lymph system sluggish in today’s world include tight clothing (underwear, bras, yoga pants, etc), school or work stress, inactivity, improper breathing (shallow, in the chest, not deep, in the diaphragm), lack of hydration (via water), and food allergies (due to GMOs & other foreign ingredients put into our food supply). In particular, processed food full of sugar and carbohydrates (also known as the SAD – Standard American Diet) is naturally toxic to the body and thus clogs everyone’s lymphatic system with enormous amounts of waste. Heavy metals, such as lead and mercury, are also a leading concern affecting most everyone’s lymph flow, due to water, food, and air contamination. Other Causes & Symptoms Persistent lymph blockage can also cause many symptoms, and (or) worsened health conditions including allergies & sensitivities, cold/flu infections, joint pain, headaches/migraines, menstrual cramps, arthritis, poor appetite, GI issues, muscle cramps, tissue swelling, brain fog, acne/breakouts, cellulite, depression, mood swings, and the list goes on. Overall, having a sluggish lymph system make you feel undoubtedly awful. However, there are also much more serious illnesses that not only target the lymphatic system, but also destroy its function completely. This is one of the worst things that can happen to the body, as it is no longer able to fight for itself. Parasites, protozoa, and bacteria, cancerous and (or) other type of disease cells from organ tissue (that would other be eliminated) accumulate, causing severe health complications including autoimmune diseases, cancers, and other chronic illnesses including AIDS, Graves Disease, M.S., Lupus, and RA. Chronic Lyme Disease, which is both an autoimmune and neurological disease, has been found to be linked to a clogged lymphatic system. By hiding in the lymph nodes of a given host, spirochetes cause large immune responses to be triggered throughout the body. However, because these responses are not large enough to actually kill the Borrelia Burgdorferi bacteria itself, it is able to stay dormant, antagonizing the body and thus weakening it until it deteriorates. Literally, Lyme bacteria are smart enough to avoid the immune responses, simultaneously making the body mad enough to respond (yet still get away without being punished or destroyed). It is no surprise then, that swollen lymph nodes (otherwise known as lymphadenopathy) are one of the most common, major, hallmarks of Chronic Lyme Disease. After spirochetes hide out and accumulate in the lymph nodes, B cells (white blood cells that fight infections) start rapidly firing, causing an autoimmune response. The bacterial spirochetes also alter the lymph nodes function, due to the accumulating B cells not forming their key, germinal centers (which is the structure needed to make a long lived antibody response, big enough to actually fight the infection). Therefore, in treating one’s late stage Lyme, it is important to address the lymphatic system and do all that is possible to support it. Essentially, if the overall function of both the immune and lymphatic system becomes strong enough, the body will be able to successfully rid itself of the persistent infection. However, it is getting to this state that is very hard, especially since everyone’s body is affected by the spirochetes differently. Overall, the lymphatic system is a big part of everyone’s daily health and wellness. Without it, we would simply be too weak to survive in the universe. Therefore, keeping lymph flow activated is incredibly important, even for those seemingly untainted by health complications. The Paleo-Primal diet and lifestyle and lifestyle, which removes all processed forms of food in favor for whole, non-inflammatory foods that our bodies were made to digest and utilize for energy and health, is one of the foundational places to start in stimulating lymphatic flow. If one does not stop the intake of man-made poisons lining grocery store shelves (including the seemingly healthy whole grains), all other aspects of draining the lymph (via supplements, activity, massage, etc) are pretty much in vein. However, when one takes this major burden out of their life, the addition of other healthy lifestyle practices such as stress management and mere movement, are able to highly benefit the lymph system in keeping up with its high demand of purifying the body. 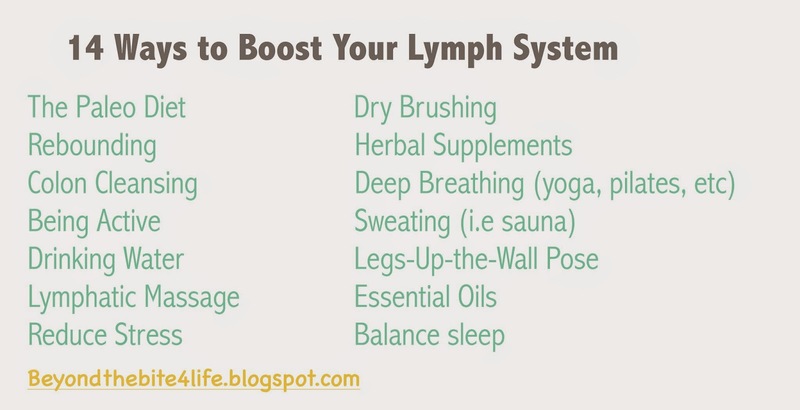 For those of you like me who suffer from a chronic illness, or have any other health complication worse than the common cold or flu, taking herbal supplements, getting acupuncture through a experienced Chinese doctor, and doing colon cleanses (i.e coffee enemas, liver flush, and colonics), are all very important things to do that help both your lymph system and overall body restore itself from the inside out. I personally love the Lymphatic Drainage Formula supplements by Physica Energetics, which are simply homeopathic supplements that I place under my tongue, allowing the herbs to permeate directly into my bloodstream. If I am unable to rebound during the day due to being away from the house, these tinkers make my leg swelling reduce by at least half. As previously mentioned, rebounding is also key in my everyday life, as without it my legs swell and overall body aches get noticeably worse. 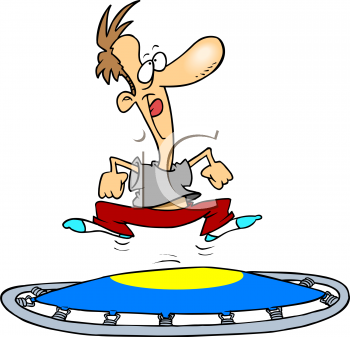 However, the act of jumping on a mini trampoline is fantastic for everyone and (or) anyone, as it gives the lymph system’s flow a much needed boost. I have become so skilled at rebounding that I can read, type, and even cook while jumping (though I do not recommend the last activity mentioned). Though I struggle with chronic fatigue, the amount of energy needed to simply bounce up and down, without necessarily taking your toes off of the trampoline, is very small. Therefore, not only is it incredibly easy and pain free, but younger children absolutely love jumping on trampolines, making rebounding an activity that the whole family can enjoy. It may sound dorky at first, but anyone truly invested in their own health will understand that it is not funny, but actually, really fun. Another technique found to help lymph flow is dry brushing. Though this technique is one that I have not gotten around to trying, it is said to also stimulate the lymphatic system by removing excess toxins that accumulate on your skin, and thus into your lymph as well. This has also been thought to help reduce cellulite, due to removing the toxins that cause connective tissue damage, however, it is not completely confirmed. Specific techniques can also be done by a massage therapist, making for a great lymphatic drainage session. Dr. Weils talks about specific conditions that can incredibly benefit from lymphatic massage therapy, as well as where to find a massage therapist near you. These techniques can also be done to a certain extent at home by the patient themselves. 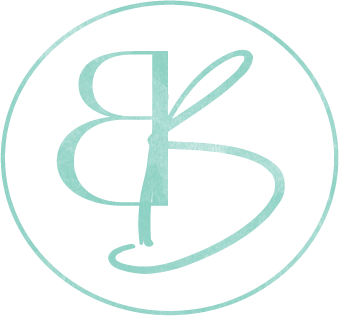 Lauren, from Empowered Sustenance, has great resources for both facial lymph massage and dry brushing. You can check them out here. Overall, I have only scratched the surface of what lymph does inside our bodies, as well as the importance of keeping it functioning optimally. Since all aspects of health can ultimately traced back to the immune and lymphatic system, it is no surprise that cancer and other diseases are on the rise in today’s industrialized world. The SAD (standard American diet), wearing “hip” clothing (that just so happens to always be too tight), and stress from a job or school load, are all common causes that cause the lymphatic system is to be very overburdened. 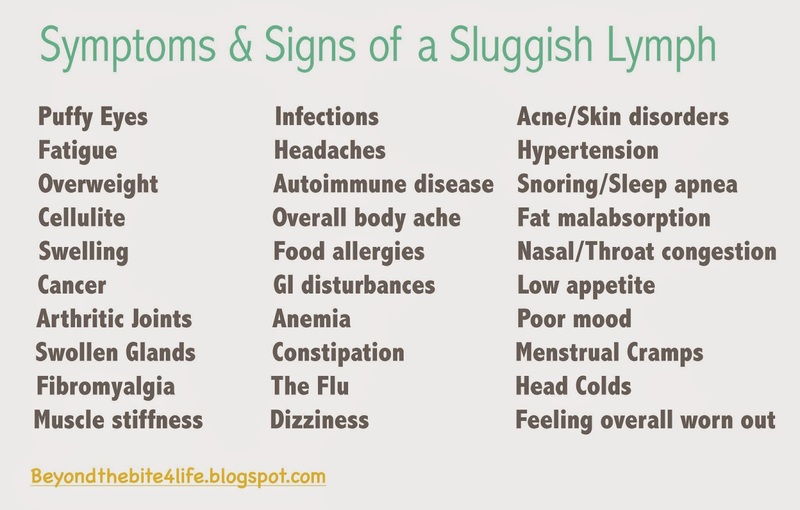 Feeling awful, facial break outs, swollen ankles, snoring, food allergies, inability to focus, headaches, unexplained cellulite, or just an overall feeling of “blah,” can all be brought back to a sluggish lymph. However, it does not have to be like this. Not only is being aware of how one’s lymphatic system incredibly important for those experiencing minor-to major health complications, but also for every other person that is alive on earth. It all comes down to that, if your lymphatic system is suffering, then you are going to suffer. Whether it begins as annoying acne, or worsens into a chronic disease, your lymph has a major roll in every aspect of health. The best way to learn how your own, personal body functions, is to first learn about the differing systems that make up every individual. From there, we are able to asses our present and past symptoms to make an educated guess on what we could be doing differently to benefit ourselves. Therefore, though Western Medicine might not make a big deal about lymphatic system health, it certainly does not mean that we should keep ignoring it. While I may be more passionate about educating people on the importance of the lymphatic system than others, the overall concept is the same for everyone – we must support our lymph (not just immune) system if we wish to live happy, healthy, and long lives. Obviously, you are not going to feel good if the primary detox mechanism in your body is worn out. When this happens, all other internal and external systems are going to be suppressed as well. While there may be many things in today’s modern world that are fighting against a healthy lymphatic system, there are just as many (if not more) ways we can combat these effects. While skin brushing, massage, and saunas may not be exactly “practical” for everyone, simply following Paleo-Primal eating strategies (i.e toxin-free), drinking enough water, being active, avoiding the typical tight fitting clothes, rebounding, and breathing correctly, can all increase lymphatic function a great deal. Get your lymph moving and get your life back! Great post. Curious about any essential oils you’re using to help with Lyme…I’m investigating that right now. It’s encouraging that I’m already doing so many of these things…but good to see a few more I can add in! Thanks for the post. Well actually, I just began my journey with essential oils! Before now, there have been too many other things going on. 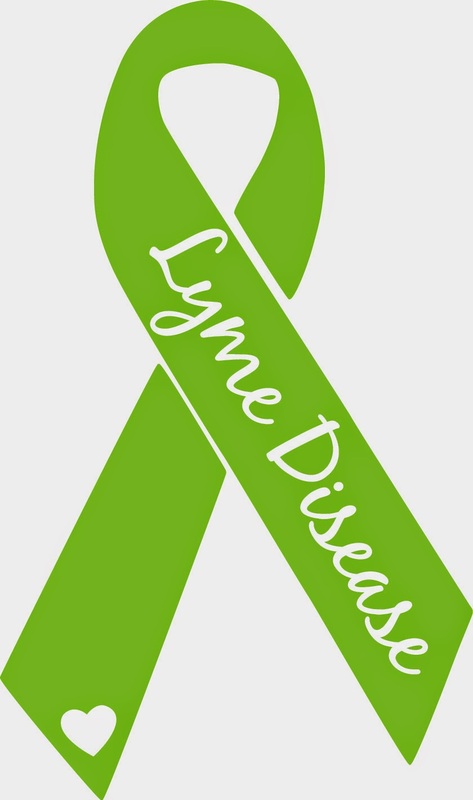 I am seeing a lady to get the “Lyme protocol” next week, and I will make sure to report back to you on what they are! How strenuous is rebounding on the knees? I have one bad knee (very little cartilage left and a meniscus tear). From what I have read, one must take extra precautions when rebounding with knee complications. However, wearing athletic (i.e. running/walking) shoes absorbs a lot of the “impact,” and acts as extra cushioning …I wish I could give you a definite answer but I am really unsure how your knee would take it! This article was most informative. Thanks for the reminder that our lymphatic system is just as important as our immune system. 3 years ago I was faced with 2 meniscus tears in both legs & arthritis began to creep in. My mobility was severely challenge. My orthos recomendation to not have knee replacements but do the drainage & therapy was eccellent advice. I am now as good as new. hi what is the drainage & therapy before i have knee replacement this 1/30/18,i`ve had one and it was the worst thing in my life, i`m 72yrs.old but knees are so painful i can hardly walk looking for a way out;thats why i`m going to try this lymph-active roll on hoping for a miracle,please let me know asap. i`m waiting JD. Hi. I have gained a lot of weight in the last couple of years, Lyme for the last 10, my weight just keeps going up no matter what I eat and I exercise. Not sure if you have come across this and know what might help. i have cut our sugar, gluten, alcohol. Nothing works. While I am not a doctor, I can share my personal experiences. I know for myself, and many others with Lyme, their thyroid is harmed, which can cause unexplained weight problems. I first had hyperthyroidism, and now hypothyroidism. HAVE ANY OF YOU TRIED LYMPHAID ROLL ON? i am getting ready going by the date you must have by now, any advice. I actually do those massages for the sinus and ears. I have a chronic condition and often wondered if the lymphatic system had anything to do with it. I do notice it always processes faster when I have to do something that involved bending over a lot, like when I dust things close to the ground at a clients house. What would normally take all day, clears out in like 3 hours. I also have knee problems on one side. I wonder if there is an alternative. Where can I purchase Lymph 1 Acute?